About: Popular with the Lesbian community, Candy Bar serves beers, wines, spirits and cocktails as well as a selection of snacks and light meals. They also have Happy Hour, a pool table and outside seating. Catering for private parties of up to 175 guests is available upon request. The Candy bar has got the' make yourself at home'feel. It is vibrant and electrifying. It is a good place to meet old friends and make new ones! I went there with my sister as to say for the moral support, she was single at that time, she met a wonderful person there and now there are still together after 2 years finding each other! 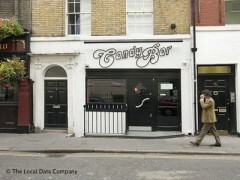 The Candy Bar has a great atmosphere, the staff are friendly and it has such a huge variety of women, it's great from a lesbian perspective. I come from a small town and the gay bars are mainly catered for men, so this was very refreshing, and i have no doubt i'll be visiting again next time i'm in the city. Soho in generally is the best place to visit!